BERNARDSTON, MA — Eight students hurried around the Bernardston Elementary School gymnasium, throwing bean bags, crawling through plastic tunnels and wheeling around on scooters. With upbeat music playing, the students’ classmates, teachers and parents encouraged them from the sidelines, often joining them at the different stations to lend a helping hand. The hour-long flurry of fun was part of the Special Olympics Young Athletes program, a district-wide display of skills that were learned through weekly training sessions, according to Sue Scott. 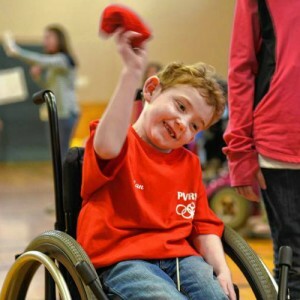 Scott is physical education teacher at Pearl Rhodes Elementary School, Warwick Community School and Bernardston Elementary School, and also oversees Pioneer Valley Regional School District’s Special Olympics program.